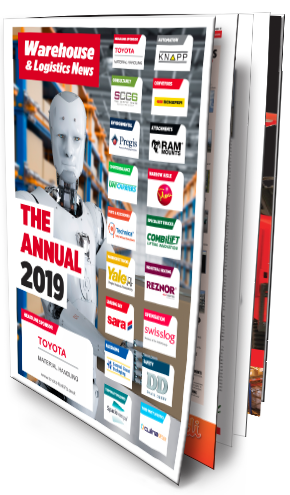 Welcome to the Warehouse & Logistics News Annual 2019, our yearly look at the suppliers and trade bodies setting the benchmark in the industry. Now in its eighth edition, the Warehouse & Logistics News 2019 is here to inform purchasing decisions and serve as a lasting information resource for all those concerned with securing warehouse equipment and logistics services. We appreciate the support of our main sponsor, Toyota Materials Handling. In the Annual we identify the key equipment and solutions categories, showcase the leading suppliers and hear from the people managing them. We also have dedicated reports from experts in the leading trade bodies. There’s no escaping the current uncertainty over the outcome of the Brexit negotiations. Businesses and key organisations like the NHS are drawing up contingency plans and looking at ways to ensure continuity of vital supplies. But whatever Brexit we end up with, British-based operations and people outside the UK looking at doing business here can be confident of having one of the world’s strongest, experienced, flexible and innovative warehousing and logistics industries on hand to support them. Britain remains a very attractive place to do business. Despite the Brexit anxieties the economic outlook is brighter than a year ago, even with pressures from the weaker pound and higher prices for oil, food and other raw materials. We are still one of the world’s biggest economies, with a large number of multinational businesses pledged to remain here, from automotive to food and drink and pharmaceuticals. Another big attraction is our strong retail sector, with its growing online element, led by global ecommerce businesses like Amazon and omnichannel retailers like Tesco. They continue to invest in supply chain operations here, contributing to the development of our world-class warehousing and logistics infrastructure. Our warehouse and logistics specialists are used to storing, handling and delivering huge volumes of goods, working at a rapid pace, supported by our 3PLs and pallet networks and expert equipment and solutions providers. We also have ports operators around the country with the potential to ease the Dover bottleneck, one of the industry’s main priorities going forward. Another outstanding characteristic of the warehouse and logistics industry is its commitment to safety and worker protection. Our supplier companies and trade associations continue to help develop European and global standards for equipment quality and safety in the warehouse and on the road, and are pledged to go on doing so in years to come. With so much to play for, 2019 promises to be a critical year for this industry. Warehouse & Logistics News will continue to lead as the sector’s only fortnightly title, keeping you updated and informed about the key issues and the latest developments.